This was an interesting job. 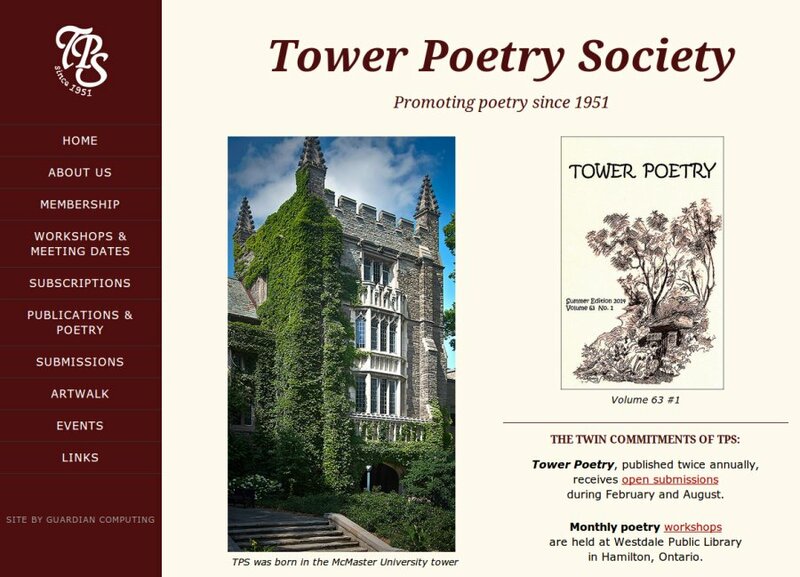 The Tower Poetry Society’s site has been around a long time and was overdue for an overhaul. It was the kind of site that was pretty popular around the turn of the millennium. It used two frames: a vertical menu on the left, and the page content displaying in a large frame to the right. This kind of design philosophy has been abandoned over the years for several reasons. Frames are annoying to work with, and you need skilled and dedicated webmasters to look after this kind of site. These old sites also look horrible on modern widescreen monitors. They’re either all scrunched up to the side, or even worse, stretched thin across the whole width of the screen. It’s hard to read and makes a bad first impression, which is certainly the last thing a group of creative writers want. So, it was time for an upgrade. The problem with this particular project was that the group really liked that old fashioned layout. They even insisted that they didn’t want sidebars or footers. So, my job was to give them a responsive WordPress site with all the advantages of the modern age, but to make the site’s look and feel resemble a site from at least 10 years ago. And I had to do it quickly and shrewdly, because poets aren’t known for having deep pockets. I quoted them a price about half of what I normally would, because I like supporting local artists. The world needs more beauty in it. I started with a premium theme in order to keep costs down. There’s not very many WordPress themes with vertical menus. I found one I liked, ripped out the sidebars and footers, changed the typography and colors, and completely redid the responsive design. I made the site have vertical menus on large monitors, with the text in two columns so it flows better on widescreens. There’s still a bit of wasted screen on HD monitors, but the clients and I both agreed that full screen was too wide for that layout. If I were to do a similar site for someone else, I’d probably put a sidebar there to fill that space. On smaller screens, such as tablets, the layout changes to a more traditional WordPress layout with the menu on top. As the screen gets even smaller, like on cell phones, the site content switches from two columns to one column. But at every stage, it retains the look and feel the Tower Poetry Society wanted. Try opening the Tower Poetry Site in a different tab and narrow the screen. You’ll see site elements jump around to make themselves look better. This is what responsive design is all about. No matter how you manipulate the screen’s width, you can’t make the site look bad. It turned out quite well. It looks like an older, simple site, but it’s easier to read, with beautiful typography, it looks good on all modern devices, and it’s WordPress. This means there’s the world’s best content management system underneath it. I spent a couple of hours on the phone, showing them how to use WordPress, and now the poets can update their site more easily than they believed would ever be possible. This means they’ll be using their site a lot more now both to self-publish and to sell their various published works. They’re weaponized poets now. And they’ve got a unique web site. That’s a rare commodity these days. So many web sites look the same. That’s because they’re themes and templates applied by “web developers” who don’t know how to code. Changing the colors and the fonts are about as far they go. If you want a site that’s all your own, you have to hire someone like me that can dive into the guts of any software package (including WordPress itself), understand it, and bend it to your will. Do you have an old site you’d like to upgrade? Would you like to be able to self-publish without having to memorize ten volumes of technical gobbledygook? Talk to me. I’ll set you up the same way I did these poets.